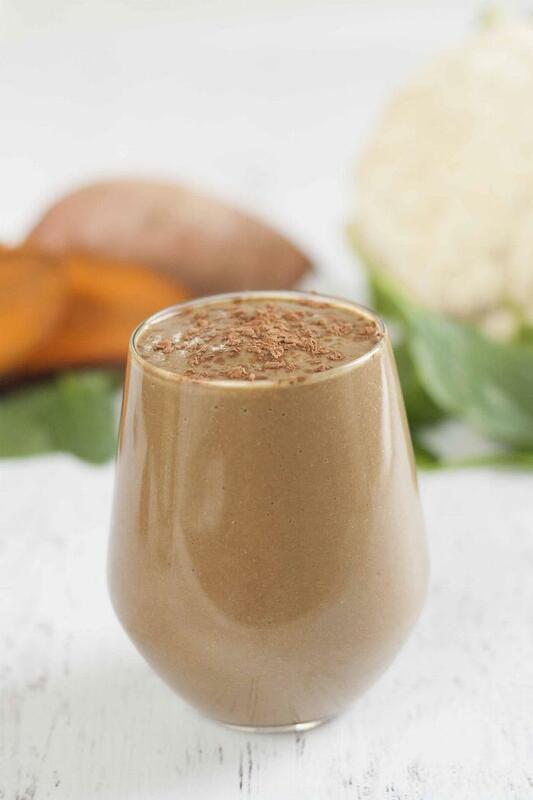 Nutrient dense cauliflower, spinach, avocado, and sweet potato all blended together in a super delicious chocolate flavored smoothie. 1Several hours prior to making the smoothie, lightly steam the sweet potatoes and cauliflower, then drain well and spread out on a small sheet pan and put in the freezer until frozen. You can prepare extra like I do and keep the excess in gallon-sized freezer bags for the next several times you want to make this smoothie. 2Add all ingredients to a high powered blender or food processor starting with the liquids. 3Blend until smooth and enjoy! 4Makes enough for one big smoothie or two smaller smoothies. *To make things even easier, I buy bags of frozen cubed sweet potatoes and frozen cauliflower florets to steam and refreeze. Cooking these vegetables before putting them in your smoothie is better for health and digestion.